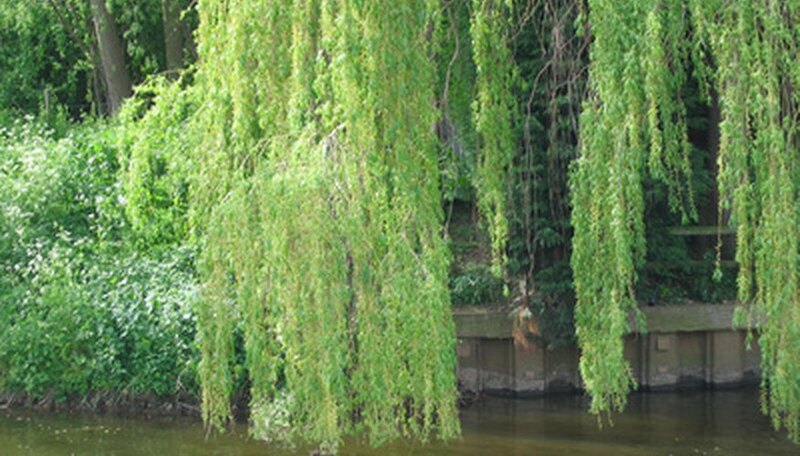 Weeping willows often grow next to bodies of water, although they can be grown in drier climates with irrigation. They grow to 45 feet high and at least as wide and have shallow roots that can grow to three times the width of their canopy. While several pests feed on weeping willows, the trees seldom sustain permanent damage, especially when they are healthy. Many insects feed on weeping willows, such as borers, aphids, scales, gypsy moths and caterpillars. Scales are small, wingless insects that look like small bumps covering the branches of weeping willows. Aphids are rounded green, red or brown insects that hide on the underside of leaves. Borers may be seen as larvae or moths. Scales and aphids generally attack the leaves of the weeping willow. Curled or deformed leaves, black soot on the leaves or a sticky substance (honeydew) on the leaves and ground are symptoms of infestations. Borers gnaw into the wood, leaving dry, dead limbs and telltale sawdust-like excrement. Caterpillars and moths eat the leaves. Healthy weeping willow trees are better able to fend off insect infestations. Weeping willows should be planted in full sun or partial shade. They need ample water and plenty of room to grow. They have shallow roots that can invade pipes and septic systems. Cultivating the soil around the willows can damage the roots. Removing dead or diseased limbs and waiting for insects to move on is the most practical solution. Spraying with a horticultural oil spray is possible, although the tree's weeping form makes reaching all limbs difficult. Insecticides should be avoided because they kill predatory insects as well as insects doing the damage. Predatory insects can manage infestations if given enough time, according to the University of California, Davis.